Music notation how good are you in reading ? This probably means I need to learn music notations more ? I learned music by myself so probably I need to improve right? For you guys it is easy? Re: Music notation how good are you in reading ? The second piece (Tarrega's Marieta) is not extremely difficult to read but requires skills in rhythm and notes in higher positions. It is of course also a much more technically challenging piece than the first one (Amazing Grace). While I can sightread both, Marieta does not flow (or sound) well without practice. Learning to read notation well should be a goal of all classical guitarists IMHO. Thanks do you know any good youtube channel or other to learn through videos how to read music notes advanced lessons? You could improve your sight-reading skills by, well, sight reading new music everyday. For example, if your goal is to improve single line reading for ensembles or lead sheet use, buy a big fake book, e.g., the Real Book, The Book. And spend 15 minutes daily reading something new. 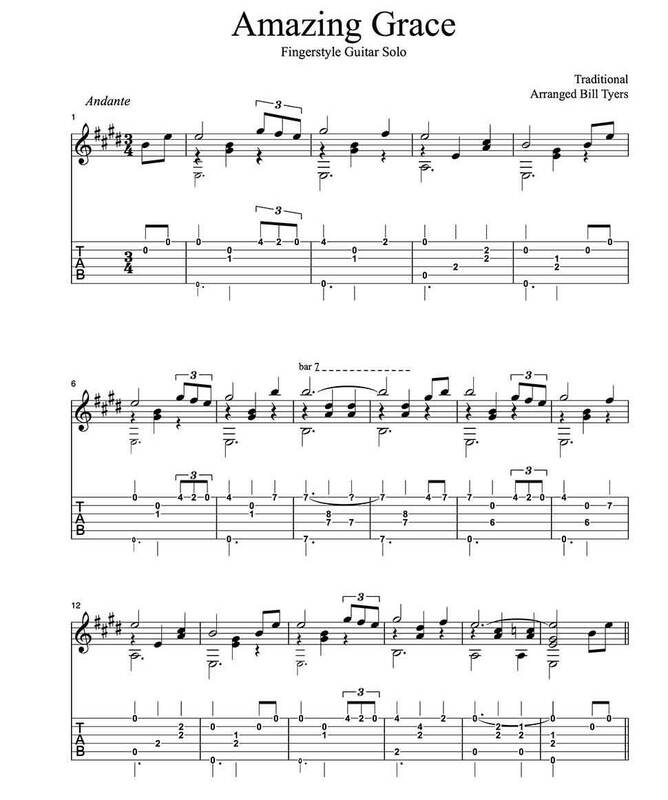 If your goal is classical guitar solos, a stack of Carcassi, Sor, Carulli, etc., etudes are a great starting point. In order for it to qualify as actual sight reading, you must play correct pitches and rhythm at tempo the first time. So it's very important to use material close to your level so you can read ahead of your fingers and anticipate oncoming patterns of rhythm, harmony and melody. Sight reading is all about the process of thinking ahead. If the music is too hard you'll be struggling with technique and kill the sight reading process. Repeating anything moves the process from sight reading to practicing! Eventually you'll hit a wall and need to target specific weak areas. For example, you might need work on syncopations or upper positions. Work shoring up your counting or upper fingerboard by practicing these things outside sight reading drills. Why? It's impossible to sight read if you don't have a counting system or know note positions. I'm not sure where you are experiencing difficulty. If you can read the easier piece you should be able to read the second piece. It's a more difficult piece, but you read it the same way. ...This probably means I need to learn music notations more ? I learned music by myself so probably I need to improve right? Yes, it is easy to read, but of course, first you have to learn how to read it, and clearly you have not yet learned how to read all the different elements of guitar/music notation. One of the main differences is that the Tarrega piece includes notations for barre chords, indications of which strings to play on, slurs, dynamics and tempo markings, etc., which are not present in the hymn score, and perhaps those are the things that you cannot read? (You did not say what it was that you couldn't read). If those things are the problem, then those are very basic guitar/music notation symbols that you will find in countless pieces, and so you definitely will want to learn more than what you currently know, if you wish to play pieces at a higher than beginner level. Well, technically, yes - but - for most of us that is a little harsh. Professionals can sight read most anything THAT well, and that's in part because they're playing hours everyday for years. The rest of us, maybe not as well. I'm not very good - musically - as far as a "real" musician would be concerned, but I still consider myself capable of sight reading. I can look at a score and "see" what it's supposed to sound like. If you can't sight read at all you can't go ahead in order to practice. I love getting a new piece and puzzling it out. If you want your general music score "reading" to improve - get a recording of a score and follow along. In addition to helping one learn to read, it's a lot of fun, another one of my favourite activities! ...If you can read the easier piece you should be able to read the second piece. Well, no, because the second piece contains vastly more notation than the first one: the first one has very little notated other than the notes themselves -- it is clearly a beginner-level arrangement -- whereas there are all sorts of additional things notated in the second piece, as to how to play the notes, where to play them, etc.. If a person only knows how to read "just the notes", that is, just the dots, then they would be able to read the first one, but not the second one (and that seems to be Thomas's problem). As for "sight-reading" -- not just "technically" but by definition -- it does mean what Peter suggested: being able to fluently play a piece that one has never seen before -- "at first sight" and with no practice or preparation beforehand, is what is meant by the term "sight-reading". Being able to read music, and eventually, with practice, being able to play it well, is not the same thing as "sight-reading" (although some people use the term incorrectly to mean that kind of music reading). However, Thomas did not ask about sight-reading -- it sounds to me like he just hasn't learned how to read music beyond the basic notes, due to the fact that he could not read the Tarrega piece with its many additional notational symbols. Tarrega's composition requires that a guitarist know where notes are to be found on the higher positions, e.g., middle C can be found in two locations on the diapason. Also, Tarrega has more Italian (piu mosso) and references to notes in higher positions, which all come with the territory. Lastly, I throw away (or give away) any music that includes "tab". "Tab" is an unneeded crutch (my take) that delays one's learning to read music. Tab is very similar to nonsensical jingles, such as, "every good boy does fine" and "all cows eat grass". Two books that I enjoy are: "Note Grouping" by Thurmond and "Casals and the Art of Interpretation" by Blum. This probably means I need to learn music notations more ? I learned music by myself so probably I need to improve right? I don't think you need to learn music notations more. I think you can learn music notations more. I don't think you need to improve. I think you can improve. I'm not sure what you are asking, sorry. It is not easy for me, but it has gotten easier. Taking turns exclusively reading rhythm or reading pitch helped me. (There's a web site called "practice sight reading" [no spaces] that helps one do that progressively, or you can use a progressive method or repertoire book.) Learning piano helped. It's a lot of patterns. This. You already know the notes on the stave and on the fretboard. That and rhythm are step one. And then it's learning the patterns. Music notation is as graphic as it is symbolic, if not more so, which means patterns you hear often correspond to patterns you see on the page. With practice you start to recognize common intervals, chords, arpeggios, rhythms and more at a glance. We learned written language the same way--from recognizing letters and then whole words at a time, to syntax. But because notation is so much more graphic, you can start training that wider vision right away (and should!) --pull back and ask what the shapes and forms the notes make are telling you; forget the exact notes--is it going up or down, fast or slow, in small or large steps, chunky or stringy, etc. Imagine how it sounds--not exactly but the gist of it. This is great to practice as you read along with recorded music as Mollbarre suggests. Anyway, that's the next step--where you're recognizing familiar ideas rather than just notes (including ideas specific to guitar) [ETA--in part because you're looking for them.] It'll come. I'm only just getting there myself. As with language, studying theory and vocabulary, and practicing writing, can help.